Most of us can probably agree that there is something seriously creepy about clowns. They’re both fascinating and compelling to watch. However, just a few sinister twists on the traditional clown outfit can turn these unique circus creatures from fun-loving Ronald McDonald types into terrifying monsters like Pennywise of Stephen King’s famous IT movie. Shudder! Evil clowns have reigned supreme on our screens for as long as we can remember. Those red shocks of hair, ghostly white faces and oversized, insincere grins have a curious effect on us… and no cute button nose or silly outfit is going to detract from such freakiness. Throw in a bit of twisted ‘humour’ and even grown adults are quaking in their boots! Tim Curry is the star of Stephen King’s famous evil clown movie, IT. 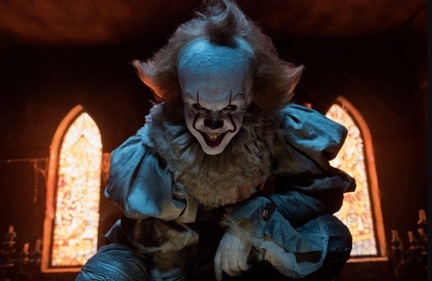 He plays the part of malevolent entity Pennywise the Clown, who lives in a sewer and terrorizes a group of preteens from Derry, Maine, in a cyclical manner. Approximately every 27 years he resurfaces from the sewers to reestablish his reign of terror. Pennywise’ horrific looks really took our fear of evil clowns to the next level. It is arguably those nasty rotten fangs that cause the most panic, but his abhorrent antics certainly didn’t help much either! The story of US born real-life serial killer John Wayne Gacy (aka. The Killer Clown) is enough to prevent even the toughest of us from sleeping. Gacy sometimes dressed as his alter ego ‘Pogo the Clown’ when out on his murdering missions. Apparently, everyone who met him as John saw him as a likable, charming and affable man, and he was well respected within the community. Scary stuff! When eventually caught in 1978, he was found guilty of killing 33 boys and young men during his six-year killing spree. In 1994 he was executed via lethal injection, but his presence has left us with sour memories and an even deeper fear of clowns! In House of 1000 Corpses, Captain Spaulding is an ugly old clown and proprietor of a gas station that also serves as a kind of haunted house ride and museum. It’s all about serial killers, madmen and freakish creatures. Captain Spaulding has the menacing motivation of redirecting a group of young adults who are researching the legend of local ‘Dr. Satan’. Instead of pointing them to their destination – the tree where Dr. Satan was supposed to have been hanged – he sets them onto a collision course with the murderous Firefly family. Clown Doll is not the main act in Poltergeist, but his role certainly kept him alive in our memories for years after watching this classic horror movie. Clown Doll doesn’t even have a name, but he doesn’t need one – the terror he invokes is down to the evil spirits who possess him and use his body to do their bidding. Anyone who has seen this film will have a healthy fear of houses built on old burial grounds, probably won’t ever leave their TV on before going to sleep, and will definitely not allow a clown doll within a hundred yards of them! American Horror Story stars a homicidal, balloon-carrying bozo. This film is packed to the seams with apparently real clown terrorists. These murdering maniacs take to the streets of suburban Michigan, terrorising homes, grocery stores and more. Twisty the Clown, the main antagonist, is a disgraced clown who was dropped on his head as a baby. He uses various twisted tactics to reestablish his position as a children’s entertainer. Twisty wears a makeshift prosthetic mask that is absolutely revolting to look at, but not half as disturbing as his own disfigured features beneath it! You have been warned! Throughout Zombieland, protagonist Columbus has a set of rules that help him avoid becoming a zombie. However, at a defunct carnival, Columbus is met by his nemesis: a huge, scarred and drooling zombie clown. This grotesque zombie clown is preventing him from reaching his sweetheart Wichita. This means only one thing: Columbus must break his rule in a very dramatic fashion, and takes a sledgehammer to the zombie clown’s head. Vulgar? Totally. It’s pretty tough to erase the resulting images from your mind’s eye afterwards, but on the other hand, there’s something satisfying about the destruction of one of the scariest evil clowns around. Last but by no means least, we’ve got Halloween’s infamous Michael Myers. His name alone is enough to make us cringe. Michael wasn’t your classic family man, as demonstrated when he dressed himself up in a clown costume and mask and went about stabbing his unsuspecting sister to death with a kitchen knife. For this heinous crime he was committed to a sanitarium, but fifteen years later he escapes and takes up his favourite pastime once again. Myers waits until Halloween when he goes out to stalk and kill teenage babysitters in his now icon creepy mask. We’ll leave you with this bit of clown trivia: did you know that some people are so afraid of clowns that there has been an official phobia allocated to this… so if reading this article and reliving the evil clowns’ antics have made you recoil in horror, it’s quite possible that you’ve got coulrophobia! Well don’t worry – you’re not the only ones!